- a varied natural environment, with rocks, plains, hills, odd-shaped trees and cactuses, colourful flowers and birds, etc. 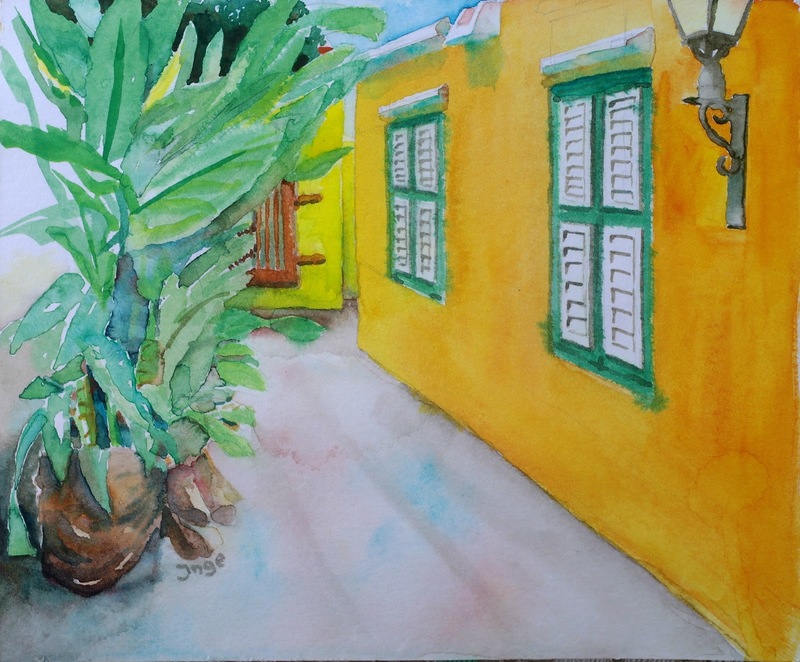 In 2011 the ‘art foundation’ of Curaçao organized the first ‘Plein Air Curaçao’. It was a success. So they decided to do it again. 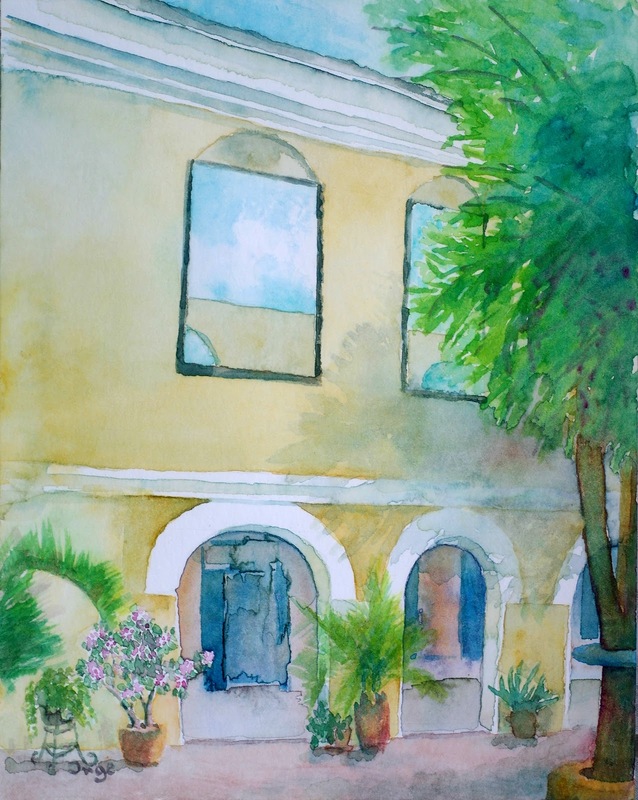 This second ‘Plein Air Curaçao’ took place in 2013, from February 22 to March 2. It was visited by artists from all over the world. I had the pleasure to be one of them. After the official opening Friday evening, early Saturday morning we went to Westpunt (as the name says: the point in the West). I sat on a terrace (for some shade). I painted my view, with the lower beach, a blue apartment complex and the hills further away. Photo: Westpunt in watercolours (bought by Hellen, president of the organizing foundation). 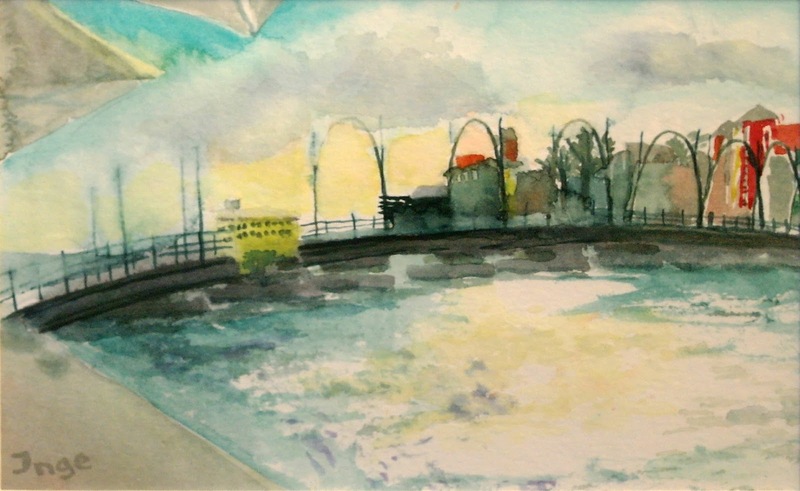 Sunday afternoon I went to Punda (the most busy part of Willemstad), to make a painting of the famous floating bridge in the afternoon light. Just before the sun went under, I had to leave. One of the artists, Heleen Cornet, had the opening of her exhibition at MonArt gallery. Tuesday was the day to paint in Otrobanda. That’s a part of the town with many picturesque old buildings and alleys. Most of the artists went to ‘Kura Hulanda’, which is totally renovated and now a hotel. But I went ‘downtown’ and painted some houses in a very narrow alley. Photo: Alley in Otrobanda, watercolours. In the afternoon we had a boat trip. We went to Boka Sami, a fishermen’s village at the South coast. First I painted the view to the land. And when the sun went down, I tried to paint the colours of the sunset. 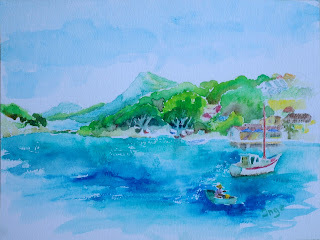 Photo: Boka Sami, view from the sea, watercolours. Wednesday I went to Kokomo beach and made a painting there. This is one of the many beaches at the South coast of the island. My painting didn’t satisfy me, so I didn’t give it for the ‘Gallery’. 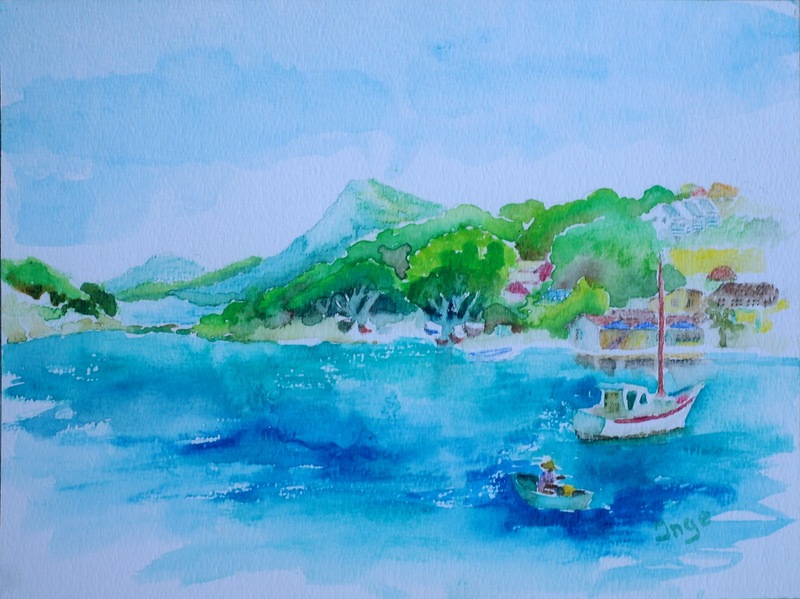 At this Gallery all participating artist could bring in the paintings they made each day. It was at the Maritime Museum. So this was a ‘growing’ exhibition. 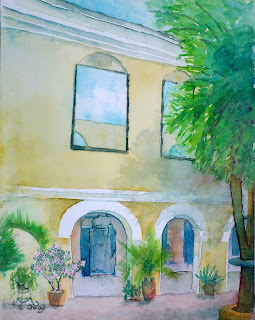 Photo: part of the Gallery of ‘Plein Air Curaçao’. Thursday was a day of ‘free painting’. Someone told me she liked the building next to the Museum, called ‘Villa Maria’. I went to look, and indeed, it was a picturesque building. It was ‘pistache green’, with large marble stairs leading to the entrance. I could sit in the shade of a tree and paint its branches and leaves in the foreground. When I brought the painting to the Gallery it was sold immediately … but I forgot to make a photo of it! Sorry. 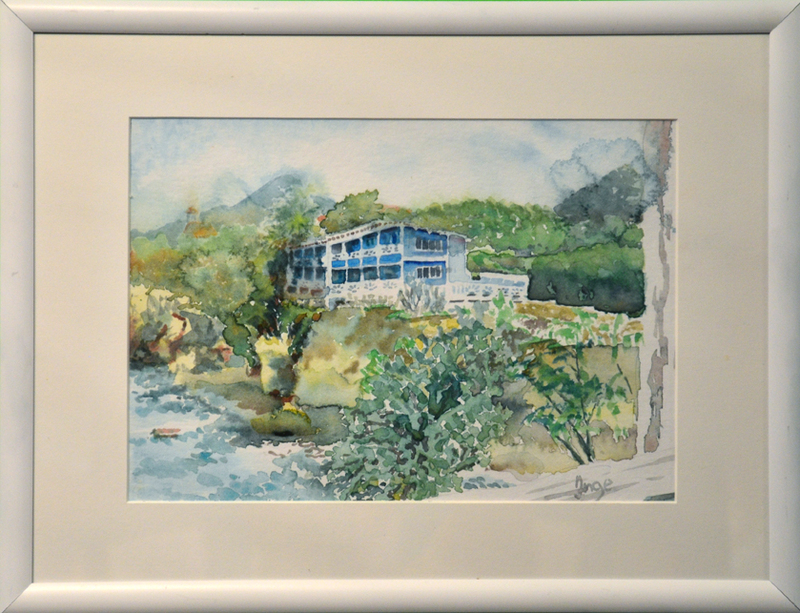 After painting Villa Maria, I went to the Avila Hotel. 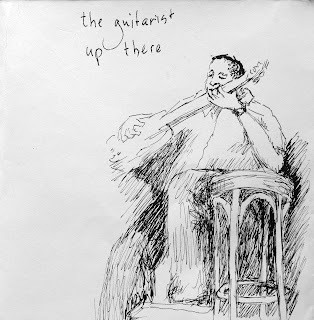 We were invited there for a Blues Night. I had all afternoon to make a painting of the hotel. And later I made some sketches of the musicians too. Friday was the ‘cultural day’. We went to Landhuis Habaai, an old mansion, partly renovated. There is a gallery of modern art now (‘Alma Blou’). We had some traditional musical instruments, from the historical museum, as subjects to paint. First I made a painting of some instruments and then of a part of the building. Saturday was the last day of ‘Plein Air Curaçao’. It was a morning of painting contests in Willemstad. There were different categories: kids, teens, beginners, local and international artists. We had three hours time to make our paintings. First we had to register and get a number. Then we could start painting, but we had to be back before noon. 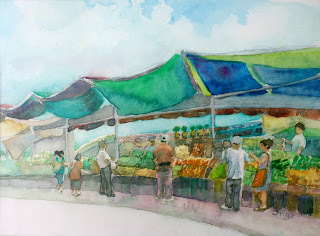 My plan was to make a painting of the ‘floating market’. This market is not really floating, it is alongside the water, but the boats bringing fruits and vegetables from Venezuela are right behind the market stands. It is a very colourful place. Photo: floating market at Willemstad, watercolours. I thought three hours were enough to make a painting. But this scene had so many details... I was back on time, but I knew I couldn’t win, my painting was too ‘illustrative’, not really a ‘work of art’. The jury decided and all winners were applauded. And that was the end of a nice week of painting plein air. All international artists went to the Maritime Museum, to say goodbye (and take back our paintings, if they weren’t sold). I was happy to read your post from Curacao! How hot was it in Curacao at that time? Temp (C)? Was this a workshop type of event meaning was there a teacher? How much was the participation fee if any? Hello, the tempereature was about 27-30 Celsius. There were workshops too, but I only joined the free 'paint outs' and the competition.